When you need more than an air filter change or someone to diagnose why your check engine light is on, The Garage Auto Repair can help. Coming to see us for more in-depth engine repairs means getting the right diagnosis and repair at the right price. With diagnostics and troubleshooting that go above and beyond what you would get at another shop, we can determine what’s wrong with your car or truck, discuss what is needed and how much it will cost, and then get it fixed so you can get back to your life. Spark Plugs – check, change, regap, and even work with broken or damaged spark plugs. Intake Manifold Gaskets – replace gaskets, and go through your intake manifold to make sure it seals up properly and won’t be giving you trouble. Ignition Coils – replace coils to ensure that your car or truck is going to start up consistently and run right. Oxygen sensors – replace sensors so your engine won’t run rough or stall out due to an improper mix of gasoline and oxygen in the engine. 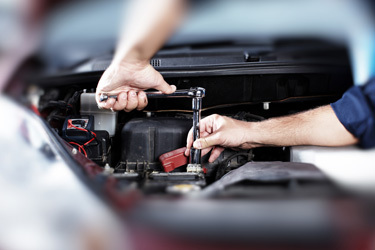 Other Sensors: engine and electric – repair or replace sensors to help your engine operate and perform at its very best. ERG Valves – replace ERG valves to make sure you’re getting the best performance from your engine. Why should you choose us for your engine repairs and services? Care – we care about our customers and their vehicles. Qualifications – our technicians are ASE Certified mechanics, so they have the auto repair industries top qualification behind them. Knowledge – we have in-depth knowledge of engines, and can make sure problems are corrected, not covered up. Price – we won’t overcharge you for our services, so you can feel confident in the value you’re getting for the money you spend on your vehicle. Scheduling – we can get you into our shop quickly, so you won’t be stuck with an engine problem while you wait around for an appointment. Not only will the Garage Auto Repair diagnose the cause of your engine problems, but they can handle any engine repairs that are needed. Our ASE Certified mechanics are qualified to take care of all your automotive engine repair needs. Get in touch with us today to schedule an appointment or stop by the shop, and let The Garage Auto Repair get you back on the road fast. Give The Garage Auto Repair a call today at (918) 806-2709.